Peter Dawson, one of the Northcote Councillors, attended the meeting and spoke in support of the plans. Peter has been involved right from the start – standing up for the Northcote Road traders and doggedly pushing officers and me to come up with a good scheme for the road. He deserves a lot of credit for the work he has done over the past two years. 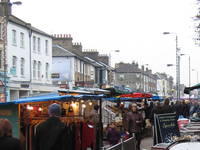 The action plan seeks to protect Northcote Road as one of London’s special places and will look at de-cluttering the street, expanding the market, holding special markets and events as well as providing help to businesses and lobbying TfL to improve the awful junction with Battersea Rise. Hopefully, we can create a vibrant street that can win the fight against the spread of mobile phone and coffee shops.